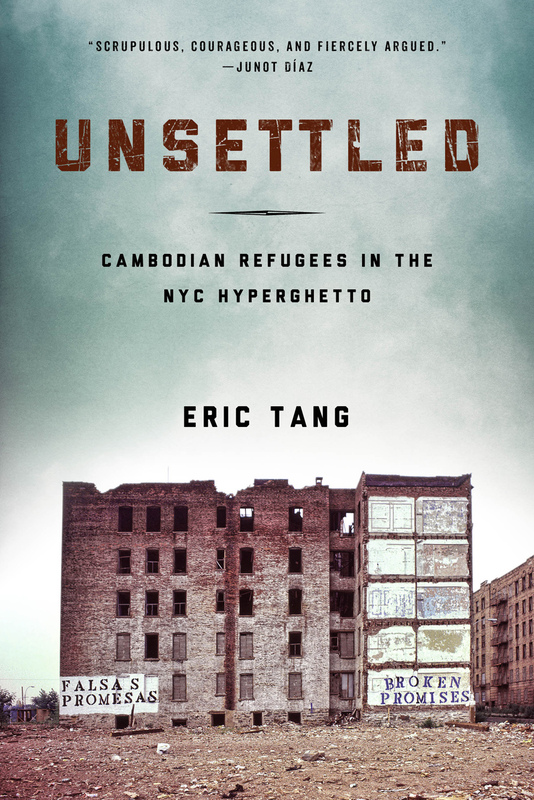 In this Q&A, Eric Tang, author of Unsettled: Cambodian Refugees in the New York City Hyperghetto, talks with Temple University Press publicist Gary Kramer about the value of publishing with a University Press and the books that were influential to him as a scholar and reader. GK: Why publish with a University Press? ET: Professors are expected to publish (their first book at least) with a University press. The expectation is that our books should be making a contribution to a certain academic field. At the same time, however, there’s this pull I feel to speak to a much broader audience—especially because I situate myself in the field of race and ethnic studies—and this led to my decision to publish with Temple. GK: What made you choose to publish Unsettled with Temple University Press? ET: Temple University Press has a long track record in race and ethnic studies. Its Asian American Studies history and culture series is the oldest and most established of its kind. When I first started reading about race, racism and social movements as an undergrad in the 1990s, TUP published some of my favorite titles. But more importantly, I noticed how those outside of academia were also familiar with these TUP titles—activist, community organizers, and artists were also reading the Press’ books. So I’ve always thought of TUP as more than an academic press; it was clear to me that it had a reach with other audiences, and this is why TUP was at the top of my list when I was looking for a home for Unsettled. GK: What observations do you have about your experiences with a university press? ET: There are a lot of things that go into making one’s decision on which press to sign with. Having gone through the process, I feel certain that the decision should hinge on whether or not the editor you will be working with really wants and gets your project. You can tell from your initial conversation with the editor if they are excited about the unique argument and contribution you desire to make in your book—if they would actually look forward to reading your book regardless of who you published with. Granted, professors are known to have healthy egos and many of us believe that everybody wants to read our books, but there’s a way in which that initial conversation with a potential editor should go—I would define it as less salesmanship and more geek—that should tip you off and make you feel certain that this particular editor and press is right for you. That’s the kind of situation that I had with my editor at Temple. GK: What do you see as the benefits and challenges of university press publishing? ET: The clear benefit of publishing with the university press is that it gets your book directly into the hands of your core audience: colleagues, graduate students, and undergraduates. The press promotes your books through academic journals and at conferences, and it gets your book reviewed by peers. The university press is set up do to all of this, which is terrific. As for challenges, the university press is obviously smaller than the trade press and therefore under-resourced. This means that whatever advance you might receive will be relatively small (and usually a first-time author won’t receive any advance) and there is very little money they offer to support authors on the production end—with essential pieces like paying for permissions and indexing. Authors have to absorb the cost of these things (or find external funding to support these items). Also, the university press does not have a lot of advertising dollars to promote your book beyond the core academic audience. Still, if a certain university press has a marketing team with extensive experience and contacts, this can more than make up for what that press may lack in raw dollars. I think it’s a mistake to think that a small university press can’t get a book reviewed in the New York Times or covered on National Public Radio. I’ve seen it happen a lot, and TUP is an excellent example of a press that reaches large markets despite its relatively small size. GK: How involved were you as an author with elements such as cover design, editing, layout, endorsements, and other aspects related to the publication of your book. ET: As for the cover design and other design elements, I think it’s important for the author to be very clear about the look he or she desires. Pick out some images that you wish to have on the cover, and present the press with some examples of other book covers that you really admire so that its design people have a clear sense of what you want. Even go so far as to make some font suggestions. However, once you do this—once you are clear about what you want—I think it’s important for you (the author) to get out of the way and let the press do its work. Don’t try to micro-manage the process or think that you are in a position to go back and forth a dozen times with the designer until they get it just right. This was my general disposition to the book design process with TUP, and it paid off for me. I was very impressed with the cover they came up with and I didn’t ask them to change a thing. GK: How has university press publishing helped your career? ET: To the extent that publishing a book with a university press is essential to meeting the criteria for promotion and tenure at a major research university, then publishing with TUP has already paid off for me. But beyond climbing the career ladder, it has also put me in touch with other scholars who I would have never met or heard from otherwise. In fact, the other day I received an email from a faculty member from the University of Hong Kong who read Unsettled and gave me wonderful feedback. GK: What are your thoughts on the university press community as a whole? ET: I think the university press has been in a steady process of moving away from its reputation as publishing house for arcane scholarly work that isn’t accessible to the public. Increasingly, I see it taking on issues that are at the center of the public discourse: police violence, immigration, LGBT issues. But as is it takes on these issues, it holds its authors accountable to scholarly rigor. Writers are expected to tell new stories, offer new ways of looking at these matters, while at the same time being in conversation with the existing scholarship. In other words, one gets the best of both worlds with the university press. GK: What books are you currently reading? I’m currently re-reading two disparate works in preparation for my next manuscript. I’m putting these two works in conversation with each other (at least in my own head! ): Sylvia Winter: On Being Human As Praxis edited by Katherine McKittrick and Mike Tyson’s autobiography Undisputed Truth. Both books are revelatory and devastating on their own, and placed together they are a true gift. GK: Was there a particularly significant titles that influenced your work and career? ET: George Lipsitz’s A Life in the Struggle: Ivory Perry and the Culture of Opposition was formative for me. For an example of how good scholarship should read—how it should hew to the sensibilities of those it writes about—I consistently turn to Robin Kelley’s Race Rebels. For pure inspiration, Edwidge Danticat’s Krik? Krak! made me understand what writing was all about, what it does for the political. Of course it made me want to be a writer, and at the same time scared me to death about what that meant, what it really takes. I guess you can say I am still stuck in the mid-1990s! It’s true for the music, too—hip hop between 1994-1996 is still the pinnacle for me. GK: What would folks be surprised to discover you reading/on your bookshelf? ET: I will read anything. From the brilliant books mentioned above to worst, most destructive self-help books you can imagine (precisely why I get to airports early for my flights — to catch up on the latest self-help degeneracy). I’m also a bit of a fanboy, I read comics. Right now, I love Saga (Image comics): all about race, gender, biopolitics and liberal warfare. I will teach it one day. The X-Men, of course. I’m staring at a stack of comics about Wolverine I just picked up at Austin’s comic con, they are resting on top of Lisa Lowe’s The Intimacies of Four Continents.